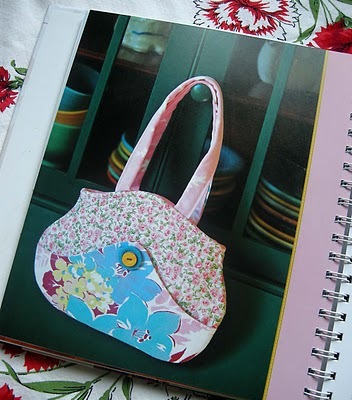 Sew Retro: Book Review and Give-away! 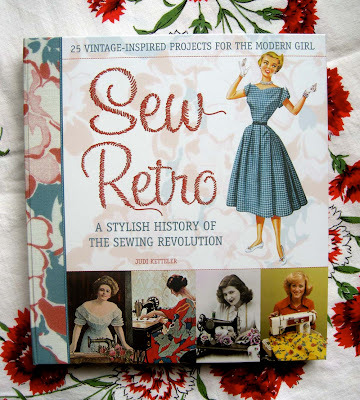 Months ago I was interviewed for a Q&A to be included in the new book Sew Retro: A Stylish History of the Sewing Revolution, by Judi Kettler, published by Voyageur Press. I was lucky enough to get my own copy (gratís) and now a lucky-one-of-you can too! 25 projects, designed by Judi, including bags, aprons, home accessories and wearables. While the projects are cute, simple and modern (with a nod to retro style), what I really love about this book is the history. I loved fashion history in college but this is even better. Judi writes in such an accessible and entertaining way that makes it really fun to read about everything from the invention of the sewing machine to thrifty sewing during wartime to the feminism and revolution in the 60’s and beyond! Each chapter spans a few decades starting with the 1800’s up to modern day. The pages are full of fun vintage fashion ephemera to look at like Victorian trade cards, magazine covers from the 50’s, sewing pattern illustrations from the 70’s, etc. I love the 70’s…now that I’m not living in them. And that was the decade where my Mom and I sewed just about every item of clothing that we wore…including bathing suits and pjs. A trip to the fabric store was an adventure…and we’d leave with a free swatch of a discontinued fabric (given to us by Mr. Schweitzer, the owner). I love the 1940’s! I think of big bands and dancers and the USO. :) my email is melboles AT gmail DOT com. well now…this IS exciting! thanks for the chance to win such an inspiring book not to mention practical….love that….my favorite dressing decade would definately be the very early part of the 20th century…i love the longer clothes, tailored, but beginning to try a little something on the risque side of the 20s….my gradmother was born in 1904 and i have always loved the old photos of her as a child and her mother….very neat. I love the fitted mod pieces of the 60s but have a more 1950s body… so usually stick with the 1950s b/c dresses inspired from that era always make me feel feminine and elicit lots of compliments! My favorite decade is definitely the 50’s! I love the dresses and crinolines. I love the 70s with all the colorful flower designs. I would be sooo happy to be the lucky one! Awww…. I’m maybe #1 for comment and #1 NEVER wins. 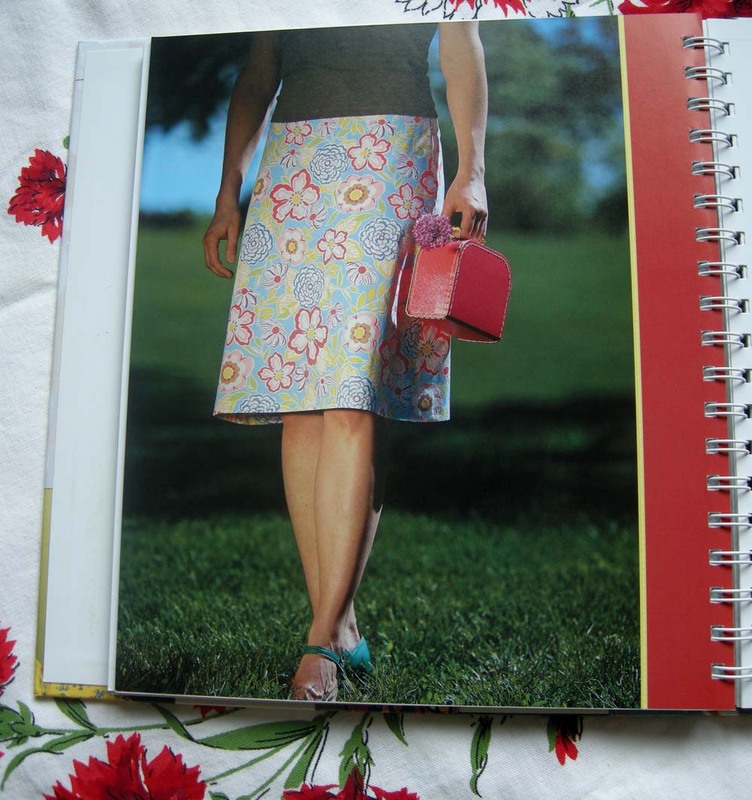 I’m entering this for my mom-in-law–my #1 Retro Sewing master…hoping she can add this one to her library. I love the look of the 50’s as well. I’m crossing my fingers for this one – looks fabulous! What an awesome book! I think the 30s – sophisticated but not as severe as the 40s and 50s… But I also love the 60s looks – I can’t pick just one! This book is GREAT! I’d love to have a copy to give to my sister-in-law. Thanks for the chance to win! That book is on my wish list for sure. My favorite decade for style/fashion is the 40’s, especially around the time of WWII. I”m with you; I love the fifties! I’ve been busy searching Ebay for patterns from that era. They take a lot of fabric but are so much fun to sew! What a coincidence!!!! Yesterday I posted about this book on my blog – I want to buy it as a birthday gift for me :-) I well deserve it!!! The 1950’s – easy! I love the hourglass shape. I love the 60’s. That is the decade I was born and I love all the photos in the album of what my Mom and sisters were wearing. That book looks very cool. Thanks for the opportunity to win a copy. This looks like such a great book. My favourite decade would be the 1950s – it’s amazing how designs from half a century ago are still utterly wearable, useable and liveable even in today’s modern settings. I like the 40’s fashion. A lot. I like 40’s fashion. A lot. I just recently got into sewing my own clothes…and even more recently, discovering retro looks! So far, I like the 50s the best! ooh, my favorite is totally the 50s… anything that flatters an hourglass figure suits me to a T! Lovely book! I like the 50’s, early 60’s. Hats and gloves and crinoline skirts in tiny waisted party dresses! Lovely. Getting dressed up to go shopping… I may not like to live it but I can admire it from afar! YES, spiral bound, thank you! I think 40’s – 50’s. So ladylike. Which is not to say that I’ve adopted that style. Just that I like it. I love the 1940s, so elegant! I should have been alive in the 40’s. I would love to win. I loved the 60’s fashion. It had just enough of the 50 and up cpoming 70’s in it. Always flattering, well, mostly. Fun and funky too. Love the wild stuff and the modesty stuff. I have to go with the ’20’s even though all vintage is such fun! The 1950’s hands down. Like others here, I have a body for that era. So lovely! I’m not really good with fashion, but I’d love to make myself a 1950s style apron and dress to make me feel beautiful as a housewife/mom. I love the 60’s, everything seemed to be changing during that time period and the clothing mirrored that change. Oh, do I love the book? I own a 1976 van and a 1977 beetle so I LOVE retro of course :) Always on the lookout for cool (70s) retro inspiration so yes I’m in! I think I would have to say the 50’s. Ohhh this book looks awesome! I think I would have to say ’30s to ’40s because it was masculine but still feminine. I think that’s when you started to see a few more stylish pant suits and the cut on dresses was more masculine. Yet you were still a lady :) Love it! The 50’s! Housewife dresses and poodle skirts! I love the 60’s look! It was a little before my time, but they all looked good! Hmm…hard to decide — 20’s or 50’s. That is so neat! I recently started watching the series Mad Men, so I’d have to say my favourite decade is the 60’s. The early 60’s in particular. nicolealbert at shaw dot ca. This looks like a fabulous book! I love history too, especially when it pertains to women and the home. I never really thought about what my favorite decade of fashion would be, but one that I like is the early 1900’s(think Road to Avonlea and Anne of Green Gables), very feminine. Another wonderful giveaway! I would love to add this book to my library. Have to go with the 50’s, love those dresses. I love reading fashion history too! The book looks fantastic! I’d have to say the 50s & 60s, mostly because I have the most fabulous box of my MILs old patterns from that era! They are to die for! Hoping for the courage to use them soon, but happily admiring them for now. thanks for the give away, & congratulations! I love this book! Thanks for the pictures. Mad Men has made me love the 60’s fashion. I have been eye-balling that book and would love to win a copy. For me the decade is the forties. I love the the highly tailored dresses and suits. I love the length of the skirts. And the satins and silks. The tap pants and the hair-dos. Oh, and the awesome platform peep-toe shoes. Oh, I love fashion history, too. Just looking at all those pictures from all those decades is fun. I think my favorite fashions are from the early seventies from when I was little. I think it’s sentiment more than anything-happy times. Wow! Seems like a book I will have to have! My favirute fashin decade: the 60’s! Thanks for this giveaway! Loved the long peasant skirts and crocheted vests we wore in the 70s! I would love to use this book to go back to 1920-1935! Fashion was so stylish and daring and also, for me the best part: very simple! You are really sweet to do this give a way! Thanks for the giveaway! Seems like a great book. I love the styles of the 1920s the best. Oh, the hats! Love the 50’s…even collect 50’s patterns. The early 60’s aren’t so bad either, but the 50’s hands down! Lovely giveaway! I’ve spent a large deal of time obsessing about the 1930’s and early 1940’s. When I was a girl we had a 1939 Ford-even my father loved this era enough to restore a car. From the gorgeous hair styles to the sophisticated dresses and fabulous wool coats, I love it! I love the 40’s! The lines of the clothes are so cool. Well I grew up in the eighties so love that decade!! But my favourite at the moment is definitely the fifties with the dresses and nipped in waists – one can dream…. Thank you! I was born in the late 60s and had/have no fashion sense! I love the styles of the ’50s! I love the cut of clothes in the 60’s! The prints are awesome too. Thanks for the giveaway, looks like an amazing book. I loved the 90s. It was when I was sewing for myself and my mom got a serger. It was so fun to sew all kinds of knits into layered outfits. Now, I’m not sure that they looked all that great, but they were fun to sew! Hummm, that a difficult one to nail down – I love the 20’s era fashions because they were so fun. I adore the 50’s – I wish I could pull off the Rockabilly style. Then there are the ’80s – while I lived it and a lot of it was ‘awful’ looking back on it I’ve got to say some of it was AWESOME and was definitely a distinctive style! Oh, picking one decade is so hard. At this moment I’ll say mod 60s are my fave. Looks like a great book! I love the styles of the 40’s…I wish I had the body type to support them! Love this book..I hope I win! What a lovely giveaway! Fingers are crossed. My favorite fashion decade the 1920s. People still took care of their appearance but there was still an element of the risque. Thanks for the giveaway! ’80’s. Not just the clothes but the hair, the make-up and the music. If I could go back in time that’s where I’d go, the bonus being I’d only be half my age as well!!!! thank you for sharing this — it looks like a fabulous book! My favorite decade is the 20s for sure. My favorite thing about it has to be the hats. the gorgeous ‘cloche’ hats. I love the clothing too, but the hats more! Oh yeah, I am totally excited about this book! I can’t pick one decade! I love the flowing styles of the 20’s, the sturdy remaking and restyling of the 30’s and 40’s, the high-fashion of the 50’s, and the bright colors, prints, and styles of the 60’s. I’m just a modern 20th Century girl at heart! I love the shape of the dresses from the 50s and early 60s. I wish I could steal January Jones’ Mad Men wardrobe! The book looks great! I’ll add it to my wish list in case I don’t score a free copy (thanks for offering one!). I’ve always wanted to be a flapper — the 20s are definitely for me!! I am a big fan of the fifties style. I’m currently having my bridesmaid’s dresses for my upcoming wedding made in a very fifties style. I would love a chance to win this book – especially as it’s aimed at beginner sewers, like me! What a chance to win that faboulous book! I´ve looked for it in swedish bookstores with no sucess. The ’40s, forever and always! Love those shoulders, waists, heels, hair and lips! I love the fifties too! the Audrey Hepburn decade ~ simple, clean lines, classy ! I’ve been feeling the 40’s lately. Looks like a great book! Oh this book has my name written all over it :) If I don’t win it here I will definitely be buying a copy asap! My fav clothes decade has to be the 50’s, also like many things about the 70’s as well (just not the polyester!)! oh, this looks like the perfect book to get me sewing! I love the late 50’s/early 60’s – the hats and white gloves, plus no t-shirts! I love the 60s mod fashion era most of all. I love it when iI come across stuff from the Sixties secondhand. I buy it even if it doesn’t fit!! Thanks for the heads up on this book! I love the 50’s. Something about the optimistic things of that era make me happy. I love the full skirts, heels, pearls, all of it. The 60s for sure. I lived through them…started out wearing gingham shirtwaists and ended up wearing mini-skirts, hippie beads and white go-go boots! Awesome book! I’d have to go with the 50s. Love the full and pencil skirts. I think my favorite time was the 50’s. Very feminine, with gloves, hats and dresses. Love it! Thanks for the giveaway, your book looks lovely! At the moment I am re-loving ’70s prints and cuts, but my all-time favourite fashion decade has to be the late ’50s for glamour, elegance and clean-lined femininity. Awesome book! I used to teach fashion (sewing) to junior high students and I would always start the semester with a couple of lessons on fashion history. Soooo fascinating to track the trends and relate them to political and social movements! It’s hard to pick just one decade as a favourite, isn’t it? I like the 1920s flapper style, but I also like the Gibson Girl look of the turn of the century. And how about those feminine silhouettes of the 1940s and 1950s? Then there’s the era immortalized by Mad Men. Sigh. I can’t pick just one…do I really have to? Your copy is opened to just my page, 30s-40s inspired thrift. I love the lines, fabric choices, and dye lots. Fantastic giveaway! oh so lovely! thanks for the giveaway! I love some of the 20s- esp the hats, and the dresses/patterns from the 50-60s. I am a 40’s girl myself. I love sewing children’s clothing from this era of vintage patterns – timeless and classic! I think my favorite decade has to be the 40s because of the sleek designs and the war time looks. The book looks fabulous, it has to go on my wish list now. Thanks for having such a wonderful give away. My favourite decade would be the 20’s…all those lovely flapper frocks, & new found freedom from corsets and other restrictive clothing. Has to be the 70’s. Loved my earth shoes and jeans, flowery tops. They could have kept disco though! Yuck! My favorite decade would definitely be 1955-1965! (That’s a decade, right? No one said which 10 years it had to be!) The fashion is reason #1 why I adore the AMC show “Mad Men”! love the 60s style! thanks for the giveaway! I love the 20’s, the decade of change and experimentation, when women wore pants, and corsets were optional. I am very drawn to the mod floral prints of the 60s, and I love mid-century modern furniture. My favorite decade was the mid-late 20’s with “flapper” fashion, close hair and fancy shoes. I really like the fifties, like in Happy Days – poodle skirts, bobby socks and oxfords are so cute! I’d love to win this book. Please enter me! Hi, thanks for this wonderful opportunity to win such a delightful book! I love the fashion of the 50s – the beautiful dresses the housewifes used to wear, imagine dressing like that – yes please! I love the 40s and 50s styles! Thanks for the chance, I’d be happy to receive such a gift. this is a hrad choice and depends on my mood but i love the skirts and sweater sets of the 50s! I’d have to say the late 50s to mid-60s. That’s when I was in high school. Lots of Paisley. I loved paisley and shirtwaist dresses. I made lots of them for myself. Oh, and “jumpers” with full skirts and fitted bodices. Nowadays, they’re called “rockabilly!” Who knew?!?! I love the styles from the 40’s. Looks like a great book! This book looks like a great addition to my library whether or not I win it! But I would love to win it! :-) Since I am hooked on ‘Mad Men’ right now, I have to say I’m all about the ’60’s in dress and decor! Thanks for the give away! My favorite would be the 60’s. What a great book! Ooo! Very exciting – I would love to try out the book. As for decades, that’s easy – 50’s, early 60’s – clothes, cars – love it! I love Coco Chanel – 1920’s everything about it! Wonderful book I am dieing to see the rest of it! The elegance of the sixties for me! Hi, I’d love to be the winner!! My faorite decade is the 30’s. I love quilts and crochet potholders form that decade. really adore the 60s and the hippy look!psychedelic colours & patterns. thanks for the great chance to win. i love the 40s and 50s – I try to incorporate the best styles from them in everything I make for myself. I love the 70’s My high school years. My 34th anniversary is today, August 20. The 70’s … happy happy memories for me and my husband. I would love to learn more about sewing!! My favorite era of fashion is the 50s! I love the beautiful dresses and of course the charming aprons. I find myself tying on an apron in the kitchen and smiling! I consider myself a beginner sewer and would love more sewing options!! Thank you! Love the 50’s and have some great prints for aprons that have been sitting just waiting for this book! i love the 50’s…everything is so beautiful! oh i would love to have this book! i will be renting from the library for sure. I love the two photos you have shared, the patterns, the fabric, they are simply lovely! I love the 30’s and 40’s – think Myrna Loy in the Thin Man movies, early Ginger Rogers, etc…although I also love Doris Day’s wardrobes from her 50’s and 60’s movies…so hard to choose! I love the 30’s and 40’s – Myrna Loy in the Thin Man movies, early Ginger Rogers…also 50’s and 60’s Doris Day movie wardrobes…so hard to choose! Looks like a fun book. I love vintage inspired things. I love the 50’s too, those women would never have thought of wearing jeans. I have to admit though, I would hate the thought of doing housework in a dress. I love the 50s style! So cute! I think the 70’s was my favorite decade for fashion followed very closely by the roaring 20’s…I know they’re so different, but I do love both. Excited about the book….thanks for doing a giveaway! Love the 50’s look in linens but starting to re-like the 60’s again. I’m wih you on the I Love Lucy dresses and fashion. Must spark “happy” from my childhood! I love dresses from the 1960s. My great aunt passed down several vintage Lilly Pulitzer dresses that are in great condition. I love wearing them! Thanks for the chance to win such a wonderful book. My favourite dressing decades are definately the 50’s and 60’s. Jacqueline Kennedy and Priscilla Presley knew how to dress. i just love retro! this would be fun to win. Picking one is so hard – but I think the late teens and 20’s edge the others out. I think my favorite time was the 60 and the hippy look and psychedelic colours!!!! love and peace!!! Definitely the 40’s. Love, love, the fitted jackets. Thank you for such an exciting give-away. I love the 50’s – pure and simple days when I was just a youngster. What a wonderful book! I love history! My favorite fashion period is probably 1900-1910ish. I love the 40’s! I always have said I was born in the wrong era, as I love everything vintage! OMGWANT! I definently lean towards the 50s (who doesn’t, right now?) but I’ve also got a real love of art deco and the 20s. My favorite decade would be the 1960’s for sewing. My mother loved to sew and when she made me clothes she would take the matching fabric and make me matching Barbie doll clothes. A very happy memory for me especially when she left me her sewing machine from that era. i think i am currently in love with the 60’s and 70’s! thanks for offering a give away! I think my favorite would be the 60’s. How lovely! Must I pick only ONE decade? The 30s and 40s were glamorous, the 50s made your figure look fantastic… but I think I’ll go with the retro-yet-oh-so-wearable 60s, Jackie Kennedy style. Thanks for the giveaway! I love the fashions from the 40’s. My mother was married in 1943 and I love the pictures of her wedding dress and her “going-away” suit that she wore as she boarded the train to go on her honeymoon with my father. They are still living will celebrate their 67th wedding anniversary on Monday! I grew up in the 80’s, but I have always loved the 20’s and the 50’s. There’s just something about flapper dresses and house dresses that appeals to me! Jane Austen and the Regency… lovely! What a fun and inspiring book! It’s great that you’re featured in it, Betz! too hard to pick just one decade!so many great fashion finds from each one!I do love the 1930’s though..the jazzy flapper look is too fun! My favorite decade was probably the 60’s to 70’s when I was a hippie. Although just watched the “Other Boleyn Girl” and the costumes were awesome. Wow this is such a fabulous book! I love the video and the entire concept of this book.. I learned to sew in 9th grade home ec.. it opened a whole world to me! I got so excited in my first comment I forgot to tell you the decade! Mine would be the 70s as that is when I learned to sew! I am a sewing disaster, but I never give up! I would love this book-thanks! I would LOVE to have this book!! I think I would love the 1950’s decade. I would TOTALLY still wear a poodle skirt!!! My favorite decade is the 60’s. I loved the mod prints and the psychadelic designs of that era. My sisters say I should have been born during the 1940s. It’s my favorite fashion era. I would love to wear around decorative hats and clothes that were made to fit women well and make them look classy. It has to be the 80s! Whitewash denim jackets covered in badges, fluorescent leg warmers, over-sized earrings and back combed hair…. 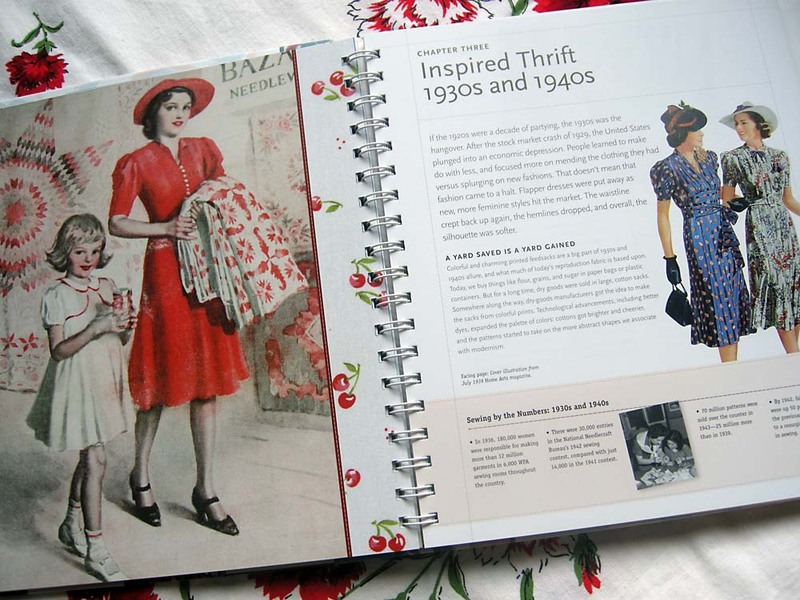 When it comes to the home though I love the retro feel of the 50s, floral fabrics, cute aprons, lace… I’d love a copy of this book to start making things for my new home! How fun! Hmm . . . I have to say I love the 40s styles. The sweet little hats and gloves, nipped in waists, high heels and red lips! So glam! I love the 30’s fashion – especially Schiaparelli and Vionnet dresses. So feminine and beautifully made. I would love to be able to sew (and wear!) dresses like that! What a great book! The 30s and 40s were so glamorous. I love the prim and proper looks of the 50’s. But I also love the freedom and flow of garments in the late 60s through the 70s. I hope I win. The 23rd is my birthday. This would be such a nice present for me. Looks like a facinating book, I know so much of my family histury is wrapped up in quilts, sweaters, linens and such. Thanks for a great give away! Being a bit more curvy, I celebrate any vintage look that features lots of swishy skirt! I love how feminine the dresses of the 50’s were… swishy skirts, as well as those great little pencil straight suits. I love retro things, and this book looks very fun. Especially since I am a rookie in the sewing department. The drop-waisted cotton lawn dresses of the 20’s have always spoken to me. So soft and sheer and romantic. I love the full circle skirts with crinolines of the 50’s. Everyone looked like ladies. The fifties “fab” to be exact are my favorite period of dressing. I have been known to clean house in a dress and a friend used to nickname me “June” as in Cleaver!! Dressing up (gloves a must) were so fun to wear as your hands stayed very clean and you never “perspired” on anything!!! I sew and can make anything I want to wear so would love to have this book!! Thanks so much. Many thanks for this giveaway., I’ve been coveting this book for a while! I love the fifties, like so many, for two reasons. Firstly, it is the most complimentary to by shape, and secondly, you can’t help feeling elegant and confident in Fifties’ style. Love the look of this book! I’m a fan of 40’s fashion, though you couldn’t tell from my day-to-day wear. I would LOVE to win this. I don’t have a favorite decade. Definitely early 60’s thanks to Mad Men! I love the outfits on the show!! just can’t go past the 50’s for great cuts and styles! Thanks for this opportunity and I love your blog. For sewing I love the 70’s hippy styles. For just looking I love the 1800’s with big hoop skirts etc. I’d love to win this book. 50s! Crisp, feminine, attention to detail. Swing skirts and fancy collars, high heels and COLOR! I love the colors and patterns from the sixties…no wonder my quilts are so bright! Looks like a wonderful book with great history! Jane Austen time :o))))) my fav!!!!!!! It Happened One Night, with Clark Gable. Such a romantic look! I love the ’50s. :) And what a fantastic book filled full of history! :) My mom would love looking through this book. This book looks great. I love the 60s! Would love to win this amazing book. I love the look of the 50’s. Thanks for sharing. Your video leaves me really, really wanting this book! Even if I don’t win, I will probably go out and buy it. My favorite fashion era is probably the 60’s. I think of how elegant Jackie Kennedy always looked. I have this thing for vintage fabrics and buy them whenever I can find them. If I had this book, I could actually use them for something! I’ll play along. Love to win that book! i agree with you, that 50’s look with the touch of 60’s mod, sadly whatever happened to the 70’s , lol the era i was a child though! My absolute fave is 1940s, *everything* 1940s. I am creating a 1940s kitchen and of course love the clothing and home dec. styles of the 1940s. I love the retro fabrics and colors of the 60’s but I did love the granny and prairie dresses of the 70’s. The book looks fun – lots of interesting projects. FUN giveaway! would love to own this book myself or give it as a gift! thanks! Wow what a cool book! I tend to wear clothes with 60’s and 70’s flair, but I love the style of the 40’s. I love everything from the twenties, from the somber, austere frocks worn by the more conservative ladies, to the glitzy flapper dresses worn by the wild girls… But I also love fashions from the fifties: the patterned fabrics, the flattering A-lines and the femininity of it all. This looks like such a cool book! I would love to win it! I love the looks of the 70s. I can remeber sewing patches on everything I owned & embroidering (by hand) designs down the front of my jeans, on the pockets, etc. I had a favorite pair of cut-off shorts on which I covered the entire rear seat area with loads of small patches in variuos colors in random order (kind of like a crazy quilt on my backside). I love the simple print cotton dresses of the 1930s. I love the 50’s too!! !